He was squadron leader in charge of torpedoes on the sole French battleship, the Bruix, anchored then in Manila Bay. After commanding a destroyer in Dunkirk from 1899 to 1900, Lieutenant Motsch spent the last ten years of his life commanding destroyers and attending several staff colleges. On April 30, 1911 Motsch, then commander of the frigate Danton, died of typhoid fever in a military hospital in Brest. 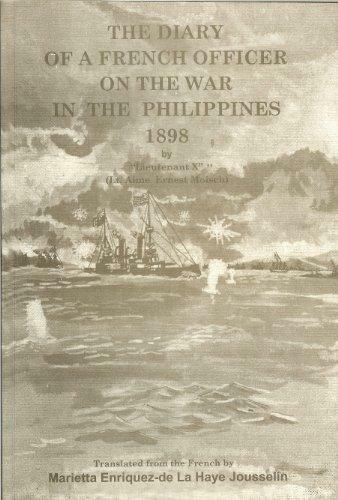 His official account was published in Paris in 1904, and entitled La Guerre Hispano-Americaine aux Philippines: du 21 avril au 16 aout 1898, par E. Motsch. Lieutenant X (Aime Ernest Motsch). “La Guerre aux Philippines.” Revue de Paris. 5e anne, tome 4 (Aug. 1, 1898): pp. 512-540; (Aug. 15, 1898); pp. 861-894. Lieutenant X (Aime Ernest Motsch). “Le Siege de Manille.” Revue de Paris. 6e anne, tome 4 (Oct. 15, 1898): pp. 802-832; “Les Americaines a Manille.” tome 6 (Nov. 15, 1899); pp. 358-394.